Army Hammer Bro is a major character and mini-boss fought before the final showdown with Bowser in Super Princess Peach. He is the one who finds the Vibe Scepter in the game. 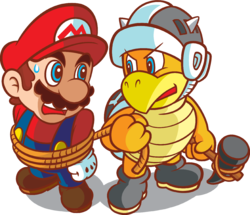 Army Hammer Bro leads the percent of the Koopa Troop made up of the Hammer Bros., although (according to the Glossary) it's unknown if he is actually any stronger at all. Army Hammer Bro is notable for being the only Hammer Bro known to possess horns sticking out of his helmet. Army Hammer Bro, clad in black armor, is first seen in the game's opening, where Bowser sends him out to cause anarchy in the Mushroom Kingdom. Taking several of his Hammer Bros. along, as well as a rather vital Goomba, Army Hammer Bro sets off to fulfill his orders. In the end, he and his troops manage to do just what they are commanded to: not only did they kidnap several Toads, they also manage to take both Mario and Luigi themselves off to Bowser's Villa. Army Hammer Bro isn't seen until the final stage of the game. As Princess Peach walks up to Bowser, she sees Army Hammer Bro in front of his king. He sarcastically rants about Princess Peach's courage, angering her. Then, Bowser uses the Vibe Scepter to power him up with Rage, and he battles Princess Peach. Army Hammer Bro is not much different than his brethren, but he does throw slightly bigger hammers and can endure more hits. Although Army Hammer Bro can summon his Hammer Bro underlings to assist him, all that Princess Peach must do is whack him with Perry five times. Then, she will move on to fighting Bowser himself. Army Hammer Bro is notably the only boss in the game to use his vibe right at the beginning of the fight rather than just after taking damage three times; additionally, he can use that vibe as many times as he wants (indicated by his roar), which he uses to summon more Hammer Bros. if there are little to no more of them. Another peculiarity of note is that, when Army Hammer Bro roars, Princess Peach can't hurt him, and hitting him with Perry only stuns her for a brief moment. This page was last edited on January 16, 2019, at 23:42.